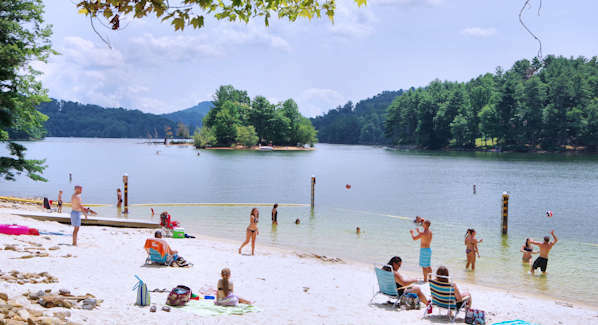 Our top pick is the Beach at Lake James State Park (pic at top of page). Go to the Paddy’s Creek Area for a large beach area with a modern bath house and protected swim area. It’s open May 1 through September 30, 10 AM-6 PM. A fee ($5/adults, $4/children 3-12) is charged when lifeguards on duty on Memorial Day Weekend through Labor Day Weekend. Find a concession stand, picnic sites, outdoor grills and kayak/canoe rentals. No pets allowed. It's about 45 miles east of Asheville near Marion and Morganton (easy drive via I-40). For much more info, go to our Lake James Beach Guide. 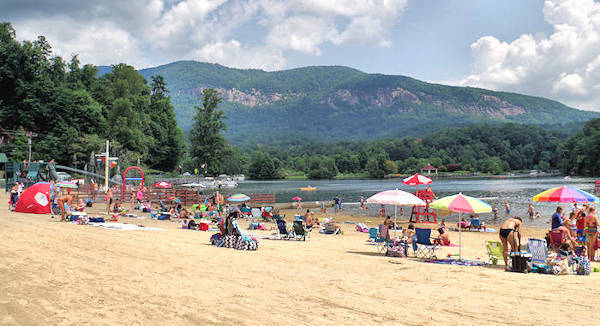 Lake Lure has the most popular beach in the mountains. It's open Memorial Day through Labor Day. 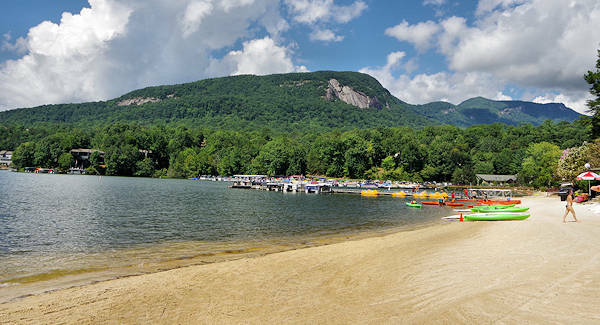 Play on the beach while enjoying the rugged mountain peaks in the Hickory Nut Gorge. Find a water park with slides and water wars game (water balloons available for purchase). One admission ($8/adult, $6/children 4-12) covers beach and water park. Their beach house has changing rooms and sells towels, chairs, sunscreen and more. Lifeguards on duty at all times. Play volleyball and picnic. Pets are not allowed. Coolers are permitted, but glass, alcoholic beverages and grills are not permitted. There’s plenty of free parking. 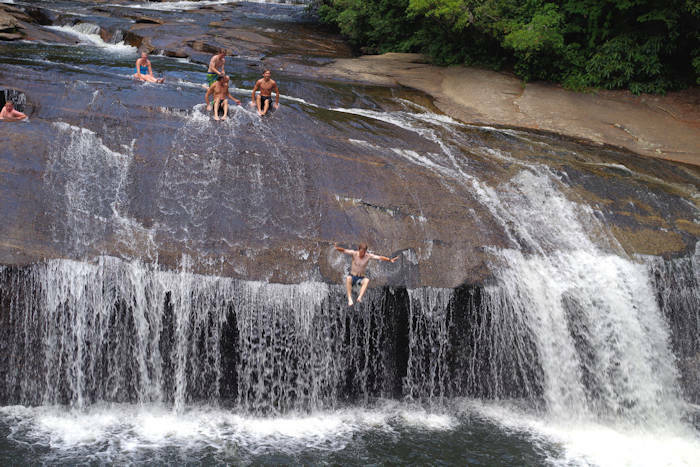 It's 26 miles from Asheville via a scenic, curvy mountain drive through Chimney Rock. Read more about Lake Lure. 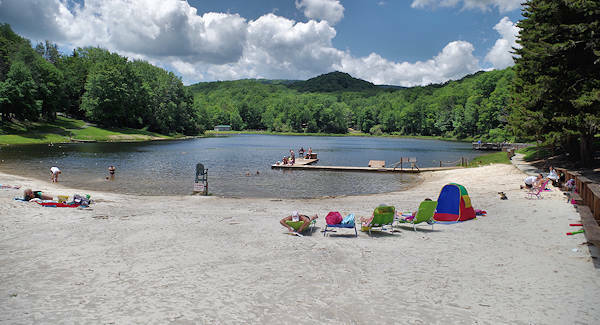 Wildcat Lake in Banner Elk is an idyllic mountain swimming spot at 3,700 feet elevation. Sun on the beach of the small lake and jump into the chilly water from the dock. Find a bath house and picnic tables. It's open seven days a week with no admission fee. Lifeguards are on duty during the summer. Alcoholic beverages and pets are prohibited. It's about 75 miles north of Asheville, near Beech Mountain and many things to do. Read more about Wildcat Lake. 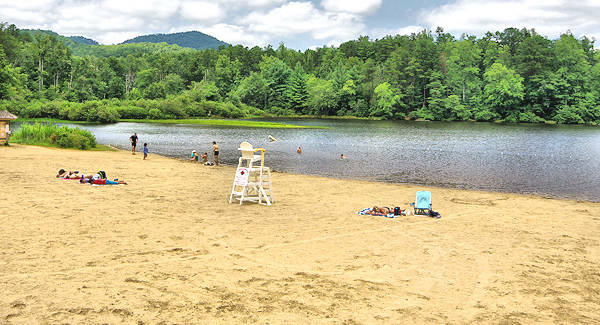 The beach at Lake Glenville near Cashiers was nicely upgraded a few years ago. Amenities at the Pines Recreation Area include a protected swimming area, sandy beach, fishing pier, picnic tables, vault toilets and parking. And it's fully handicap accessible. There are no lifeguards or concessions. Pets, glass containers and alcoholic beverages not allowed. Free admission. From Highway 107 in Glenville, take Pine Creek Road two miles to "Pines Recreation Area" on the left. You can also rent a pontoon boat at Signal Ridge Marina to explore some more secluded beaches along one of the islands in the lake. It's about 75 miles southwest of Asheville. Read more about Lake Glenville. Just 12 miles from downtown Asheville is Lake Powhatan in Pisgah National Forest (near the NC Arboretum and Blue Ridge Parkway). The small lake has a sandy beach with a lifeguard, and it's adjacent to the popular Bent Creek mountain biking trails. This is a popular camping spot as well. It's open every day 10 AM-8 PM. If you are not a camper, there's a $2/person day use fee. No pets on the beach. Bring your snacks and drinks since there are no concessions. Also find an easy hiking trail around the lake. Read more. The Rumbling Bald Resort on Lake Lure has a private beach for their overnight guests in their rental homes and villas. Find plenty of amenities and options for fun in the water. Beach chairs, umbrellas, paddleboards and kayaks available to rent. Nearby find a lazy river and two outdoor pools. Read more about them. 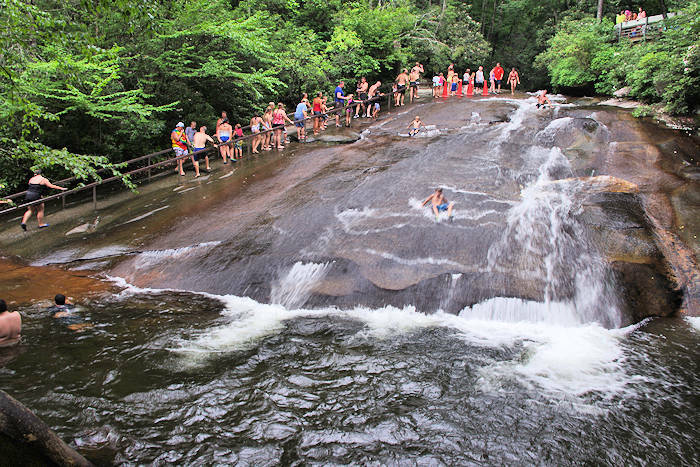 For more options for splashing around, see our Top 20 Mountain Swimming Holes. And for outdoors fun, see our Top 70 Outdoor Things to Do in the North Carolina mountains near Asheville.